As the snow begins to fall in areas of upper Michigan, and some lower Michigan communities, it is time to start thinking about the joys of winters recreation! 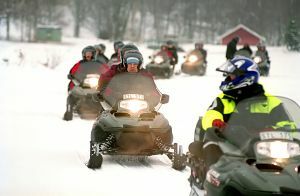 Michiganders are known for their love of the UP, snowmobiling, hunting, and ATV riding. At USA Powersports, located in Dundee, MI, we make it easy for recreational enthusiasts all over Michigan to own their very own snowmobile, ATV, or other power sport vehicle. Taking pride in holding the title as Michigan’s largest showroom of used snowmobiles, ATVs, or motorcycles, USA Powersports offers great pricing and financing options for everyone! With hundreds of gently used snowmobiles, USA Powerspots wants to make sure you are geared up for winter riding. With a full line of late model, gently used, pre-owned Polaris, Arctic Cat, Polaris, or Ski-Doo snowmobiles, you are sure to find the perfect used snowmobile for your Michigan riding adventures. As well as outstanding pricing on snowmobiles, USA Powesports is your one stop shop to all the accessories you need to make your snowmobiling season complete. From riding gloves, helmet cams, helmets, to gear bags and covers, we have it all. Stop in today, to save big and stock up on winter accessories. Why spend way too much money on a brand new snowmobile that as a Michigander, you will only use for three months out of the year? Wouldn’t you rather pay 25-50% less for a used snowmobile that is just as high of quality? With financing options available for everyone, regardless of your credit score, at USA Powersports we will do our best to make sure you are loading a snowmobile onto your trailer before the heavy snow! We have added information on our financing program, as well as pre-finance submission forms, so you can get a jump start on your purchase. If you have any cars, trucks, ATVs, boats, older model snowmobiles, or motorcycles that you would like to trade-in, USA Powersports will apply the trade-in value to your purchase of one of our high quality used Snowmobile in our Michigan dealership. If you have any question on purchasing or financing a high quality used snowmobile this winter, feel free to contact our friendly staff at 1-800-963-9216. We will do our best to answer any questions or address any concerns you may have. Be sure to like us on Facebook, to stay up to date on check-in deals, great savings, and special events! See you soon!